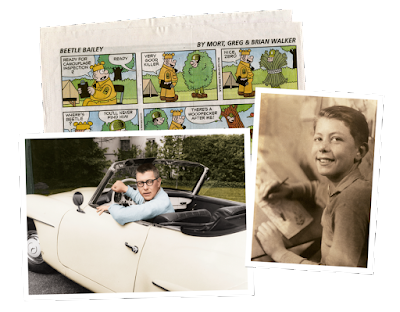 Pop Culture Lunch Box: Best Magazine Reads: Beetle Bailey and Connecticut's "Cartoon County"
Best Magazine Reads: Beetle Bailey and Connecticut's "Cartoon County"
I've visited Fairfield, Connecticut before because some of my wife’s cousins live there. What I didn’t know about the outer New York City suburb is that it had been home to an inordinate number of famous daily-newspaper cartoonists. Mort Walker (pictured to the right) is perhaps the most famous of the crew detailed in a fantastic article in the September issue of Vanity Fair. I rank his Beetle Bailey as one of my favorite dailies, up there with Archie, Garfield, Peanuts, and, actually, several other strips emanating from Cartoon County, including Hagar the Horrible, Blondie, Popeye, The Family Circus, and Hi and Lois. The place also has ties to Superman, Tarzan, Prince Valiant, and many others. It’s really pretty phenomenal. The cartoonists lived different lives than the working men (and the cartoonists seem to have been all men) who headed into the city each day. They sat at home in their offices that smelled of sharpened pencils, tobacco, and whiskey, were pretty domesticated by their families, and only went into the city on Wednesdays to show off their latest works to various publishers and editors. Then sometimes they would go to gatherings with the other cartoonists to drink lots of Manhattans. And they played quite a bit of golf and took lots of naps. Pretty nice work if you can get it. Maybe that’s why “cartoonist” was always on my short list of potential professions! The author, son of the Prince Valiant cartoon, notes that Cartoon County was a quirk in time. Cartoonists were rock stars, creating the most-read portions of the newspapers, up until the early 60s, when Hearst killed what the group considered its Mount Olympus, the New York Journal-American. Then later Wall Street further killed Fairfield County as an affordable place where cartoonists could live comfortably. Even I remember a time when the newspaper would clunk down near the front door. I would run out to get it and grab the funny pages, and maybe sometimes the sports section, and throw the rest of it down wherever. At that point, I was a remnant of an earlier age, when just about every kid (and adult) couldn’t miss the cartoons each and every day, with the special, fuller, mostly-color Sunday editions being the highlight of each week. Wow this post makes me so nostalgic! I used to love Beetle Bailey. I'm going to go hunt for some funnies to read right now!